Washington State distillers are dreamy (you probably have realized my feelings in this already, as I do go on – but they are awesome! ), with so many worthy bottles out already, and more continuing to be released regularly. The latest example? 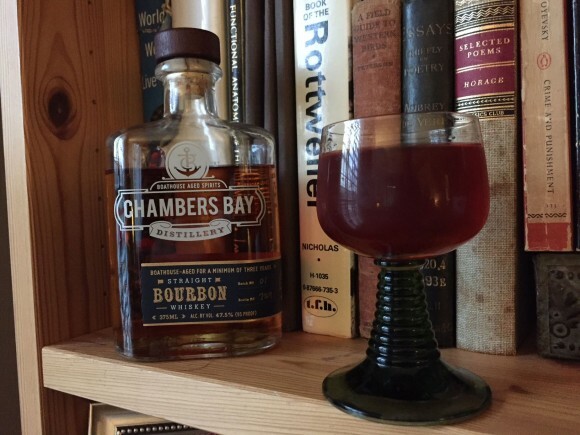 Chambers Bay Straight Bourbon. A follow up to their highly-regarded 20-month aged Greenhorn bourbon, Chambers Bay Straight Bourbon is aged 3-1/2 years, and made from sweet yellow corn and soft white wheat from Grant County, WA, and the distiller’s proprietary wild-yeast strain harvested from a local apple orchard. If that wasn’t enough, though, the real sets-it-apart-thing here is that the aging takes place on a boathouse floating on the Puget Sound – from what I’ve been told, it’s the only whiskey in the world aged that long on the water, where the waves and tides speed up the aging (that’s the theory, at least). End result? A darn tasty tipple, with some nice sweetness from the wheat, and a mingling of sea-salted caramel, toffee, fig, orange, and chocolate. It’s dandy to enjoy as a solo act, but of course I also wanted to try it in cocktails, and after trying this and then trying that, liked it best in The Hounds They Start to Roar. That drink has a bit of a history, which we won’t get it to too much here (you’ve already read the full story in Ginger Bliss and the Violet Fizz anyway, right? Right! ), but I will remind you that the name comes from a Tom Waits’ song, as do the ingredients, in a way. Said ingredients are bourbon, naturally, but also St. Elizabeth Allspice Dram (the spice flavors contained therein, cinnamon, clove, and others, go wonderfully with the Chambers Bay bourbon mélange), brandy (which helps balance everything out), and Peychaud’s bitters (which adds another herbal tint or two). Together, it’s a drink fit for any sailor, dog lover, song-singer, or person reading this blog, which means you. Take it out for a walk or a sail and see if I’m right. 1. Fill a cocktail shaker or mixing glass halfway full with cracked ice. Add the whole bunch of ingredients. Stir well. 2. Strain into a cocktail glass or comparable.